Songs keep depression and headaches at bay. They help us sleep better. Songs can change our mood when we are angry, sad or feel lonely. Frankly speaking, music is important and we cannot live without it. When the internet network was in a preliminary stage, people tuned into the local radio station and bought VCRs to enjoy music. The internet and computers have changed the picture completely. Because of the computer, we can convert a music file from one format to another. New encoding algorithms generate smaller music files as compared to old algorithms. Because of the small size of files, we can save 100s of tracks on our mobile devices. The internet gives us access to millions of songs. This is the internet age and music crazy people don’t bother to listen to songs from an unknown artist. All they need is an enjoyable background score, soothing lyrics, or a superb voice. If you have listened to a new song at a public place, radio station, in public transport or your favorite music player app, but you don’t know the singer behind it, download and use the following apps to identify songs. Shazam is the most downloaded song identifier app. It has a superb rating of 4.4 on various app stores. It is a powerful app that gives you access to a huge collection of songs. Despite having an enormous music library, Shazam displays song details within a few seconds. The app is so popular that popular artists such as Adele, Demi Lovato, and others use it to discover new music. 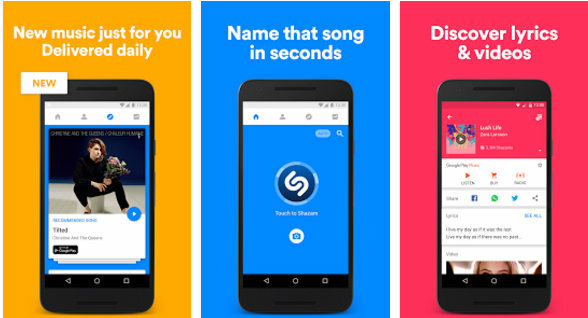 Shazam offers a user-friendly interface. The UI is fast and beautiful. How to make Shazam identify a song? You’ll enter into the tagging screen aka interface. Tap on the circular button with the Shazam logo. Play the song you want the app to identify or hold the phone near the music source. The app will now take a couple of seconds to recognize the song. The music recognition app displays links to music streaming services. Apart from identifying music, Shazam can recognize TV shows too. The app packs a visual recognition module that doubles up as a good QR code reader. Shazam can work as a karaoke app as it displays lyrics of a song line-by-line. SoundHound is the 2nd best app to find the song name. It is also one of the greatest alternatives to Shazam. SoundHound has a superb interface. It doesn’t prompt users to register account or sign into the app with Facebook or Google. Toolbar with options to open search history, discover new music, music world map, inbuilt music player. Round button with an orange SoundHound logo. Tap on the circular button and the app will enter into listening mode. Hold your mobile device near the speaker of the TV, PC, Laptop and wait for a few seconds. SoundHound will now recognize the song. It will then show the song’s details and lyrics. The app recognizes words you speak. 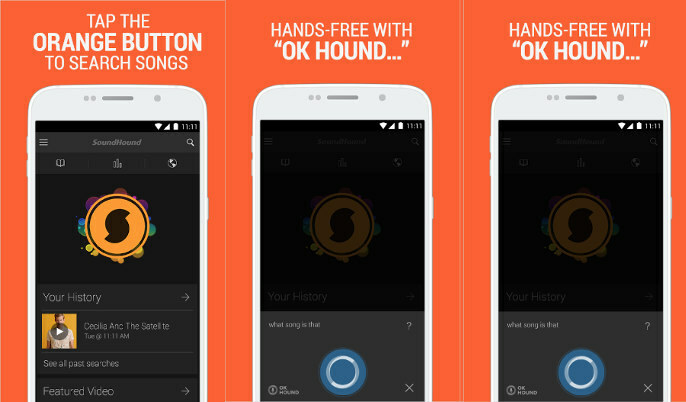 Hence, instead of playing a track, you can hum the lyrics of the song and wait for the app to show its details. Sony Corporation, one of the biggest names in the world of electronics and digital goods owns the TrackID app. TrackID is a powerful app to find the song name online. It works in the same manner as Shazam and SoundHound. This music recognition application shows a slideshow when you run it for the first time. The 1st slide displays brief information on the app. The 2nd slide asks you to accept terms and conditions. Discover top tracks country wise. Listen to live music stream. Tap on the round button to make the TrackID app recognize the song and show its information. The Sony TrackID app does a commendable job of identifying songs. It has a well-designed music player module. The app provides links to the song’s official YouTube video. It supports over 59 international languages. 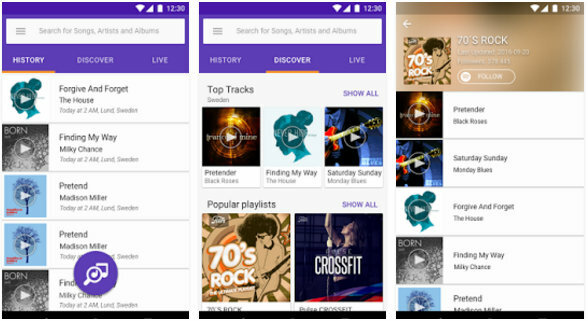 If you’re an Android user and you’re searching for a simple tool to identify a song, then this app is for you. Sound Search is an utility launched by Google. 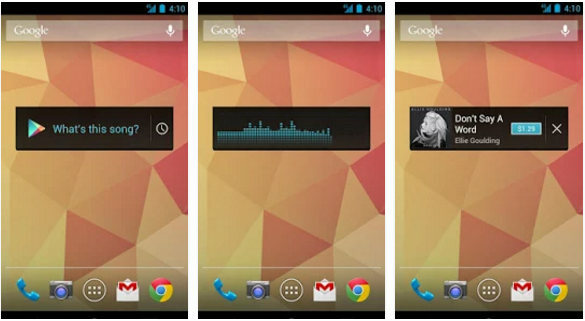 Once you install SS from the Play Store, the application will add a simple widget to your mobile device home screen. The widget has “What Song is this?” text. You have to tap on the text and wait for Google to recognize the song. Users can add the widget to the lock screen. Once Google Sound Search finds the name of the song, it will open a link to download the song on the Google Music Store. MusixMatch is yet another reliable and popular music recognition app. Unlike other apps we’ve mentioned in this article, MM shows options to register a new account, log in with FB or Google account, and skip account registration. Tap the skip option. The app will now ask you to play a random song on YouTube to make you aware that it works. One YouTube plays the song, open MusixMatch once again and tap on its menu bar. Now, select the identify lyrics option and tap the dark orange button. MusixMatch provids many interesting features. It is one of the best apps to identify songs. 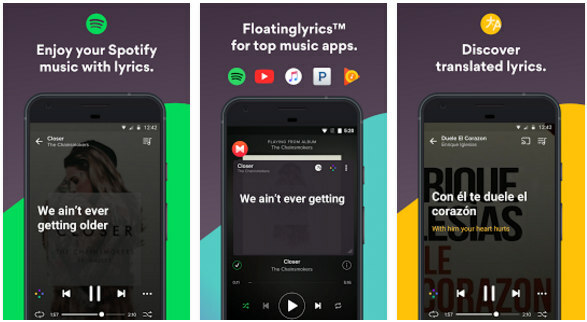 Conclusion: We have shared the most reliable, fastest, and top-rated song identifier apps for Android mobiles and iPhone/iPad in the above paragraphs. The applications have an accuracy within 95 to 100%. They are free and don’t require you to create an account. You can use the apps anytime you want. They are error free. Hence, the OS on your phone or tablet will not crash.